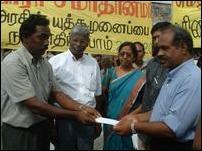 At the conclusion of the human chain agitation compaign, a memorandum was handed over to the Thenmaradchchi Divisional Secretary Mr.S.Srinivasan addressed to the President Ms Chandrika Kumaratunge, sources said. The two-page memorandum appealed to the President to take immediate action to resume peace talks with the LTTE, which has been accepted by Tamil people as their sole representative. The memorandum further requested the President to take steps to restore normalcy in the lives of Tamil people and to find a lasting peace by meeting the legitimate political aspirations of them, sources said.
" 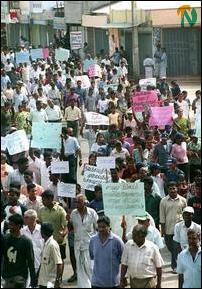 Tamils feel that the GOSL is preparing its armed forces for another war. 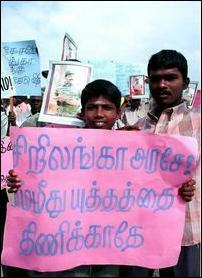 Tamils hate war. They are prepared to achieve their lost rights through peaceful negotiation," said the memorandum. Steps are afoot to hold similar campaign in other parts of Jaffna peninsula and in the entire NorthEast in days to come, sources in Chavakacheri told.